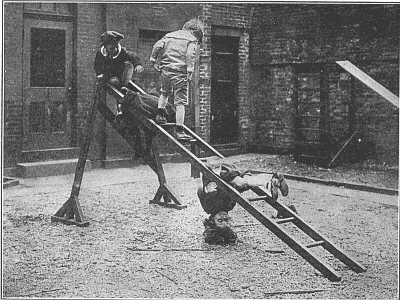 A Catalogue Of Play Equipment, by Jean Lee Hunt. What are the requisites of a child's laboratory? What essentials must we provide if we would deliberately plan an environment to promote the developmental possibilities of play? These questions are raised with ever-increasing insistence as the true nature of children's play and its educational significance come to be matters of more general knowledge and the selection of play equipment assumes a corresponding importance in the school and at home. To indicate some fundamental rules for the choice of furnishings and toys and to show a variety of materials illustrating the basis of selection has been our aim in compiling the following brief catalogue. We do not assume the list to be complete, nor has it been the intention to recommend any make or pattern as being indispensable or as having an exclusive right to the field. On the contrary, it is our chief hope that the available number and variety of such materials may be increased to meet a corresponding increase of intelligent demand on the part of parents and teachers for equipment having real dignity and play value. 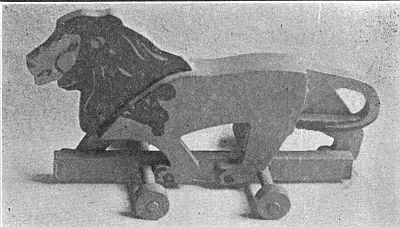 The materials listed were originally assembled in the Exhibit of Toys and School Equipment shown by the Bureau of Educational Experiments in the Spring and Summer of 1917, and we wish to make acknowledgment, therefore, to the many who contributed to that exhibit and by so doing to the substance of the following pages. Chief among them are Teachers College, The University of Pittsburgh, The Ethical Culture School, The Play School and other experimental schools described in our bulletins, numbers 3, 4 and 5. 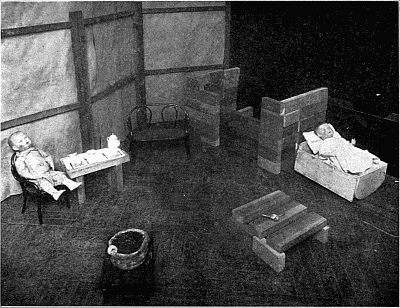 The cuts have been chosen for the most part from photographs of the Play School, where conditions fairly approximate those obtainable in the home and thus offer suggestions easily translatable by parents into terms of their own home environment. While this equipment is especially applicable to the needs of children four, five and six years old, most of it will be found well adapted to the interests of children as old as eight years, and some of it to those of younger children as well. New York City, June, 1918. Out-of-door Furnishings should be of a kind to encourage creative play as well as to give exercise. Adaptability to individual or group use. It should lend itself to solitary play or to use by several players at once. Safety. Its use should be attended by a minimum of danger. Suitable design, proper proportions, sound materials and careful construction are essentials. Durability. It must be made to withstand hard use and all kinds of weather. To demand a minimum of repair means also to afford a maximum of security. 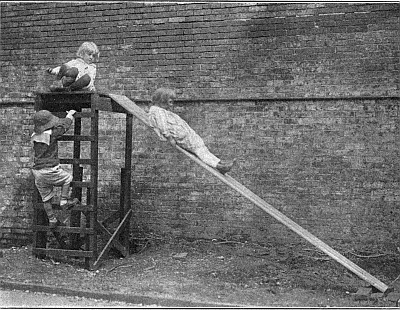 [A-1]Dr. E. H. Arnold, "Some Inexpensive Playground Apparatus." Bul. 27, Playground Association of America. 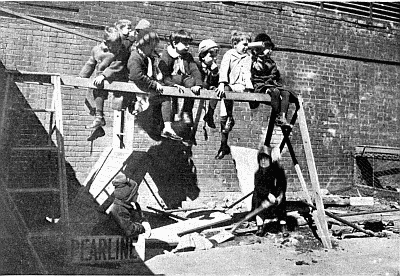 [A-2]Dr. E. H. Arnold, "Some Inexpensive Playground Apparatus." Bul. 27, Playground Association of America. In the country, ready-to-hand resources, trees for climbing, the five-barred fence, the pasture gate, the stone wall, the wood-pile, Mother Earth to dig in, furnish ideal equipment for the muscle development of little people and of their own nature afford the essential requisites for creative and dramatic play. To their surpassing fitness for "laboratory" purposes each new generation bears testimony. If the furnishings of a deliberately planned environment are to compare with them at all they must lend themselves to the same freedom of treatment. 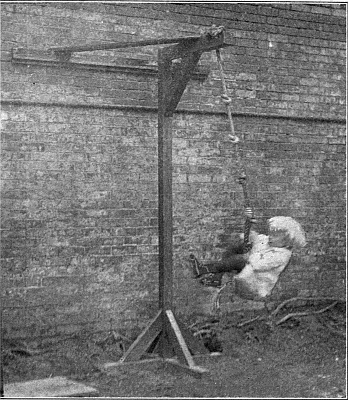 The apparatus shown here was made by a local carpenter, and could easily be constructed by high school pupils with the assistance of the manual training teacher. The ground has been covered With a layer of fine screened gravel, a particularly satisfactory treatment for very little children, as it is relatively clean and dries quickly after rain. It does not lend itself to the requirements of organized games, however, and so will not answer for children who have reached that stage of play development. 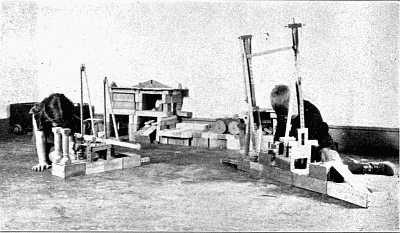 A number of building bricks, wooden boxes of various sizes, pieces of board and such "odd lumber" with a few tools and out-of-door toys complete the yard's equipment. Board--Straight grain lumber, 1-1/8" x 9" x 12'-0". Two cleats 1¼" x 9" bolted to the under side of the board to act as a socket on the hip of the horse. 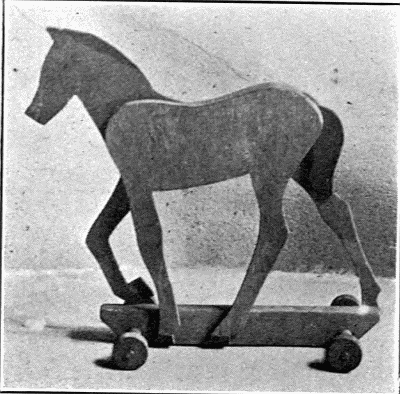 Horse--Height 25". Length 22½;". Spread of feet at ground 20". Legs built of 2" x 3" material. Hip of 2" x 3" material. Brace under hip of 7/8" material. Note--All figures given are for outside measurements. 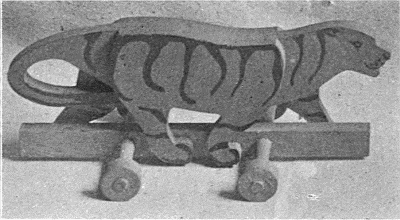 Apparatus except see-saw board and sliding board should he painted, especially those parts which are to be put into the ground. Stand or Platform--26" wide, 30" long, 5'-4" high. Top made of 1-3/8" tongue and groove material. Uprights or legs of 2" x 3" material. Cleats nailed to front legs 6¼" apart to form ladder are of 1-1/8" x 1¾;" material. Cross bracing of 7/8" x 2¼;" material. Apron under top made of 7/8" x 5" material nailed about 1-1/8" below to act as additional bracing and provide place of attachment for iron hooks secured to sliding board. The stand is fastened to the ground by dogs or pieces of wood buried deep enough (about 3') to make it secure. Slide--Straight grain piece of lumber, 1-1/8" x 12" x 12'-0". Two hooks at upper end of sliding board are of iron, about 3/8" x 1½;", set at a proper angle to prevent board from becoming loose. Hooks are about 1¼;" long. Upright--3" x 3" x 6'-9". Top Piece--3" x 3" x 2'-9". Upright and top piece are mortised or halved and bolted together. Bracing at top (3" x 3" x 20½" at long point of mitre cuts) is nailed to top piece and upright at an angle of about 45 degrees. Upright rests on a base measuring 3'-0". This is mortised together and braced with 2" x 3" material about 20" long, set at an angle of about 60 degrees. 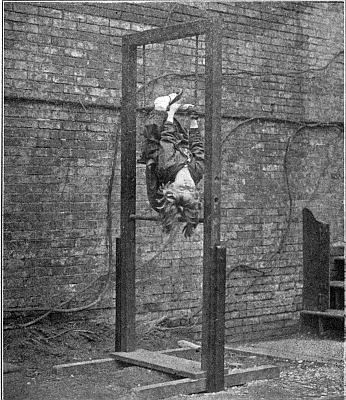 Unless there are facilities for bracing at the top, as shown in the cut, the upright should be made longer and buried about 3' in the ground. The swinging rope (¾" dia.) passes through a hole bored in the top piece and held in place by a knot. Successive knots tied 8" to 9" apart and a big knot at the bottom make swinging easier for little folks. Two Uprights--3" x 3" x 6'-10". Top Piece--3" x 3" x 2'-10". Ends of top piece secured to uprights by being mortised or halved and bolted together. 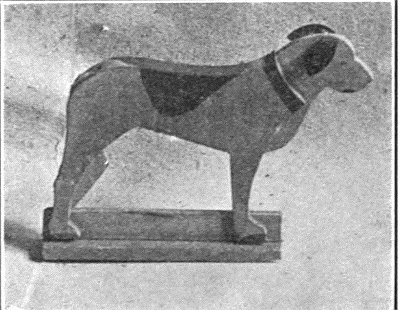 Uprights rest on bases of 2" x 3" material, 3'-7" long, connected by a small platform in the form of an H.
Bases and uprights are bolted to dogs or pieces of wood 2" x 4" x 5'-8" set in the ground about 3'-0". Adjustable bar (round) 1-3/8" dia. 3 holes bored in each upright provide for the adjustable bar. The first hole is 3'-0" above ground, the second 3'-5", the third 3'-10". Swing bar (round), 1-3/8" dia., is 20" long. Should hang about 16" below top piece. 2 holes 5/8" dia. bored in the top piece receive a continuous rope attached to the swing bar by being knotted after passing through holes (5/8" dia.) in each end of the bar. At upper ends of the sides a u-shaped cut acts as a hook for attaching the ladder to the cross bar of the support. These ends are re-inforced with iron to prevent splitting. Support--Height 4'-6". Spread of uprights at base 4'-2". Uprights of 1½" x 2½" material are secured to a foot (1½" x 4" x 20½") with braces (11½" x 2½" x 12") set at an angle of about 60°. Tops of the two uprights are halved and bolted to a cross bar 1-1/8" x 2½" x 10" long. The uprights are secured with diagonal braces 1-3/8" x 3½" x 3'-9" fastened together where they intersect. A borrowed step ladder converts this gymnastic apparatus into an airship. The ladder detached from the support is an invaluable adjunct to building and other operations. The two bars are 2" x 2¼" X 6'-10" and are set 16½" to 18½" apart. The ends are beveled and the tops rounded. Each bar is nailed to two uprights (2" X 3" X 5'-0") set 5' apart and extending 34" above ground. An overhang of about 6" is allowed at each end of the bar. 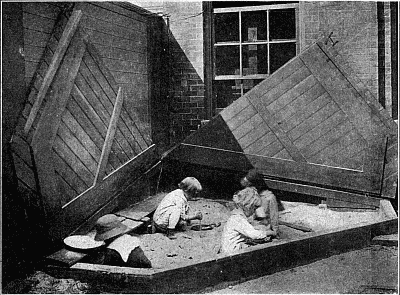 The sloping cover to the sand box pictured here has been found to have many uses besides its obvious purpose of protection against stray animals and dirt. It is a fairly good substitute for the old-time cellar door, that most important dramatic property of a play era past or rapidly passing. 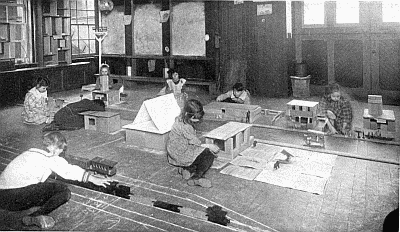 In addition to its more obvious possibilities for constructive and manual development, Miss Rankin's experiment offers social features of unusual suggestiveness, for the village provides a civic experience fairly comprehensive and free from the artificiality that is apt to characterize attempts to introduce civic content into school and play procedure. 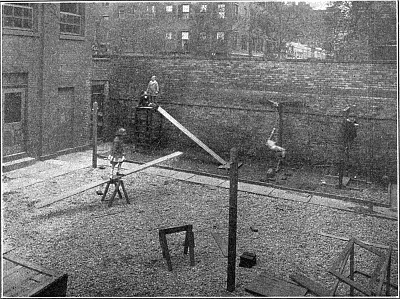 [B] See "Teachers College Playground," Bulletin No. 4, Bureau of Educational Experiments. A Suitable Floor--The natural place for a little child to play is the floor and it is therefore the sine qua non of the play laboratory. Places to Keep Things--A maximum of convenience to facilitate habits of order. Tables and Chairs--For use as occasion demands, to supplement the floor, not to take the place of it. Blocks and Toys--For initial play material. 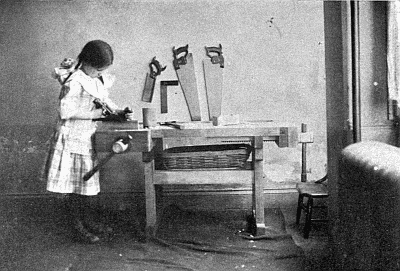 The Carpenter's Bench--With tools and lumber for the manufacture of supplementary toys. A supply of Art and Craft materials--For the same purpose. The floor should receive first consideration in planning the indoor laboratory. It should be as spacious as circumstances will permit and safe, that is to say clean and protected from draughts and dampness. A well-kept hardwood floor is the best that can be provided. Individual light rugs or felt mats can be used for the younger children to sit on in cold weather if any doubt exists as to the adequacy of heating facilities (see cut, p. 32). Battleship linoleum makes a good substitute for a hardwood finish. It comes in solid colors and can be kept immaculate. Deck canvas stretched over a layer of carpet felt and painted makes a warm covering, especially well adapted to the needs of very little children, as it has some of the softness of a carpet and yet can be scrubbed and mopped. 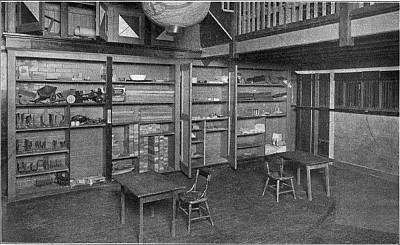 Second only in importance is the supply of lockers, shelves, boxes and drawers for the disposal of the great number and variety of small articles that make up the "tools and appliances" of the laboratory. The cut on page 24 shows a particularly successful arrangement for facilities of this kind. The chairs shown are the Mosher kindergarten chairs, which come in three sizes. The light tables can be folded by the children and put away in the biggest cupboard space (p. 24). Block boxes are an essential part of the equipment. Their dimensions should be planned in relation to the unit block of the set used. Those shown are 13¾;" X 16½" X 44" (inside measurements) for use with a set having a unit 1-3/8" X 2¾" X 5½". They are on castors and can be rolled to any part of the room. 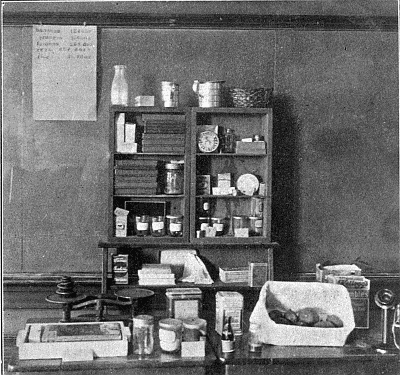 The low blackboards are 5'-5" in height and 2'-0" from the floor. All the furnishings of the laboratory should lend themselves to use as dramatic properties when occasion demands, and a few may be kept for such purposes alone. The light screens in the right-hand corner of the room are properties of this kind and are put to an endless number of uses (see cut, p. 40). The balcony in a room with high ceiling. The balcony and a low ceiling. 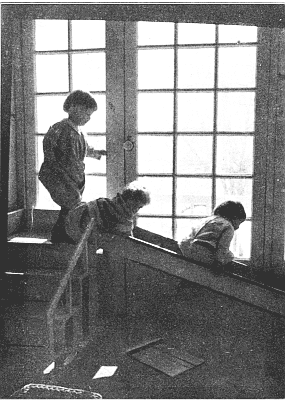 The balcony is a device to increase floor space that has been used successfully in The Play School for several years. It is very popular with the children and contributes effectively to many play schemes. The tall block construction representing an elevator shaft shown in the picture opposite would never have reached its "Singer Tower proportions" without the balcony, first to suggest the project and then to aid in its execution. Drop shelves like those along the wall of the "gallery" (p. 22) can be used for some purposes instead of tables when space is limited. 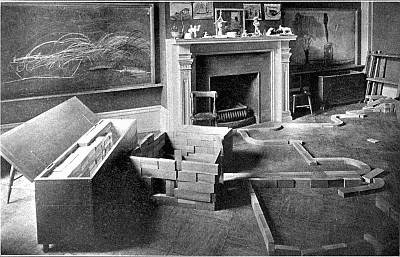 Materials for storekeeping play fill the shelves next the fireplace, and the big crock on the hearth contains modelling clay, the raw material of such objets d'art as may be seen decorating the mantlepiece in the cut on page 20. 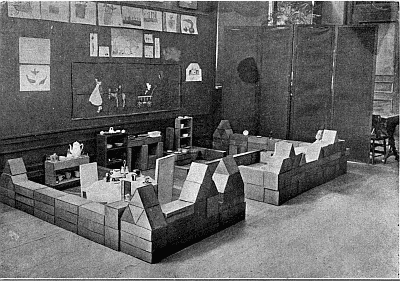 The indoor Sand Box pictured here was designed by Mrs. Hutchinson for use in the nursery at Stony Ford. A box of this kind is ideal for the enclosed porch or terrace and a great resource in rainy weather. The usual kindergarten sand table cannot provide the same play opportunity that is afforded by a floor box, but it presents fewer problems to the housekeeper and is always a valuable adjunct to indoor equipment. The carpenter equipment must be a "sure-enough business affair," and the tools real tools--not toys. Utility box--with assorted nails, screws, etc. Choice of lumber must be determined partly by the viewpoint of the adult concerned, largely by the laboratory budget, and finally by the supply locally available. Excellent results have sometimes been achieved where only boxes from the grocery and left-over pieces from the carpenter shop have been provided. Such rough lumber affords good experience in manipulation, and its use may help to establish habits of adapting materials as we find them to the purposes we have in hand. This is the natural attack of childhood, and it should be fostered, for children can lose it and come to feel that specially prepared materials are essential, and a consequent limitation to ingenuity and initiative can thus be established. On the other hand, some projects and certain stages of experience are best served by a supply of good regulation stock. 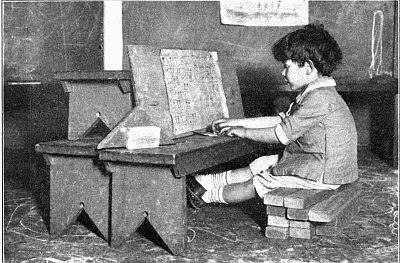 Boards of soft pine, white wood, bass wood, or cypress in thicknesses of ¼", 3/8", ½" and 7/8" are especially well adapted for children's work, and "stock strips" ¼" and ½" thick and 2" and 3" wide lend themselves to many purposes. They must be suggestive of play and made for play. They should be selected in relation to each other. They should be consistent with the environment of the child who is to use them. 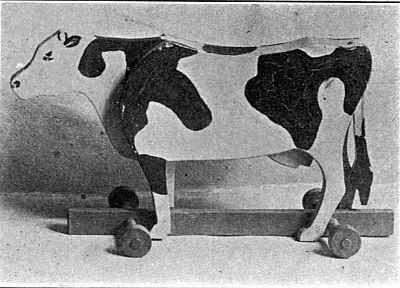 They should be constructed simply so that they may serve as models for other toys to be constructed by the children. They should suggest something besides domestic play so that the child's interest may be led to activities outside the home life. They should be durable because they are the realities of a child's world and deserve the dignity of good workmanship. "I find this empire of the floor much more vivid in my memory now than many of the owners of the skirts and legs and boots that went gingerly across its territories." H. G. Wells, "The New Machiavelli," Chapter 2. 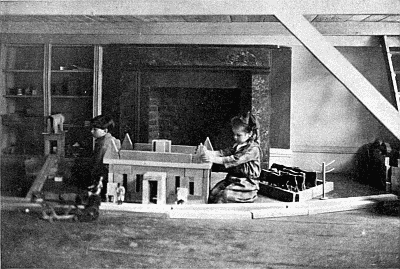 Nowhere else, perhaps, not even in his "Floor Games" and "Little Wars" has Mr. Wells, or any other author succeeded in drawing so convincing a picture of the possibilities of constructive play as is to be found in those pages, all too brief, in "The New Machiavelli" where the play laboratory at Bromstead is described. 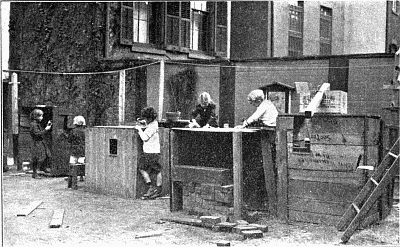 One can imagine the eager boy who played there looking back across the years strong in the conviction that it could not have been improved, and yet the picture of a child at solitary play is not, after all, the ideal picture. Our laboratory, while it must accommodate the unsocial novice and make provision for individual enterprise at all ages and stages, must he above all the place where the give and take of group play will develop along with block villages and other community life in miniature. In his reminiscences of his boyhood play Mr. Wells lays emphasis on his great good fortune in possessing a special set of "bricks" made to order and therefore sufficient in number for the ambitious floor games he describes. Comparatively few adults can look back to the possession of similar play material, and so a majority cannot realize how it outweighs in value every other type of toy that can be provided. Where the budget for equipment is limited, floor blocks can be cut by the local carpenter or, in a school, by the manual training department. 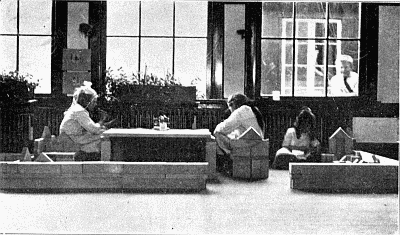 The blocks in use at The Play School (see cut, p. 20) are of white wood, the unit block being 1-3/8" X 2¾" X 5½". They range in size from half units and diagonals to blocks four times the unit in length (22"). At present there is but one set of blocks on the market that corresponds to the one Mr. Wells describes. These are the "Hill Floor Blocks," manufactured and sold by A. Schoenhut & Co., of Philadelphia. They are of hard maple and come in seven sizes, from 3" squares to oblongs of 24", the unit block being 6" in length. There are 680 pieces in a set. Half and quarter sets are also obtainable. They are the invention of Professor Patty Smith Hill of Teachers College, Columbia University, and are used in The Teachers College Kindergarten and in many other schools. Oblongs, 2½" X 5" X 10". Pillars made by cutting oblongs into two parts. Plinths made by cutting oblongs into two parts. Light weight 12" boards, 3'-0" to 7'-0" long. 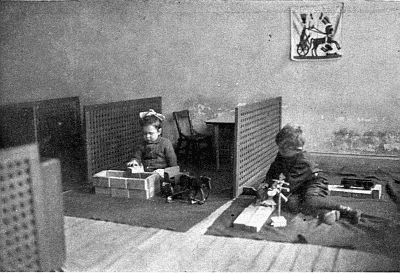 C. Froebel's enlarged fifth and sixth gifts. E. Architectural blocks for flat forms. As children become more dexterous and more ambitious in their block construction, the Peg-Lock Blocks will be found increasingly valuable. These are a type of block unknown to Mr. Wells, but how he would have revelled in the possession of a set! They are manufactured by the Peg-Lock Block Co. of New York. Cut on a smaller scale than the other blocks described, they are equipped with holes and pegs, by which they may be securely joined. This admits of a type of construction entirely outside the possibilities of other blocks. They come in sets of varying sizes and in a great variety of shapes. The School of Childhood uses them extensively, as does The Play School. 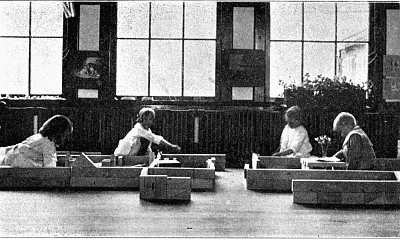 [C] See University of Pittsburgh Bulletin, "Report of the Experimental Work in the School of Childhood." 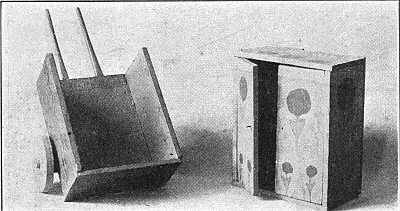 The "Do-with Toys" shown in the accompanying cuts were designed by Miss Caroline Pratt some years ago to meet the need generally felt by devotees of the play laboratory of a consistent series of toys to be used with floor blocks. For if the market of the present day can offer something more adequate in the way of blocks than was generally available in Mr. Wells' boyhood, the same is not true when it comes to facilities for peopling and stocking the resulting farms and communities that develop. Mr. Wells tells us that for his floor games he used tin soldiers and such animals as he could get--we know the kind, the lion smaller than the lamb, and barnyard fowl doubtless overtopping the commanding officer. Such combinations have been known to children of all generations and play of the kind Mr. Wells describes goes on in spite of the inconsistency of the materials supplied. 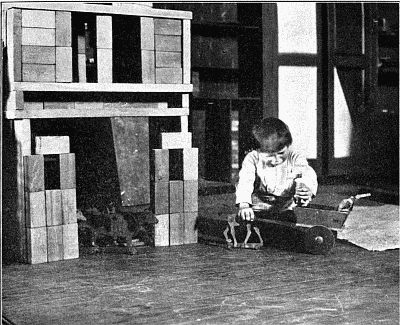 But when we consider fostering such play, and developing its possibilities for educational ends, the question arises whether this is the best provision that can be made, or if the traditional material could be improved, just as the traditions concerning blocks are being improved. A few pioneers have been experimenting in this field for some years past. 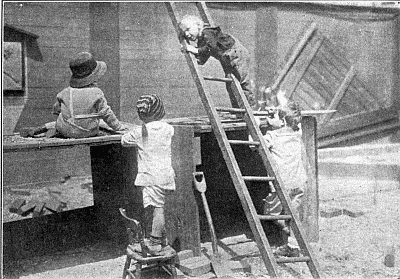 No one of them is ready with final conclusions but among them opinion is unanimous that constructive play is stimulated by an initial supply of consistent play material calculated to suggest supplementary play material of a kind children can manufacture for themselves. 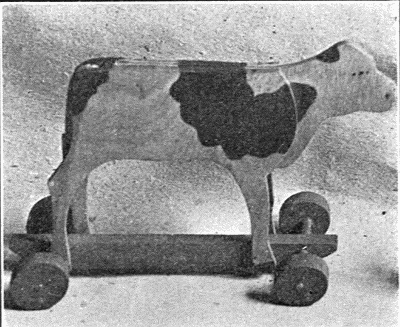 Blocks are of course the most important type of initial material to be provided; beyond this the generally accepted hypothesis is embodied in the "Do-with" series which provides, first a doll family of proportions suited to block houses, then a set of farm animals and carts, then a set of wild animals, all designed on the same size scale, of construction simple enough to be copied at the bench, and suggesting, each set after its kind, a host of supplementary toys, limited in variety and in numbers only by the experience of the child concerned and by his ability to construct them. This working hypothesis for the selection of toys is as yet but little understood either by those who buy or those who sell play materials. The commercial dealer declares with truth that there is too little demand to justify placing such a series on the market. Not only does he refuse to make "Do-withs" but he provides no adequate substitutes. 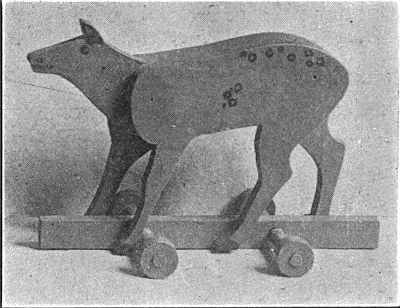 His wooden toys are merely wooden ornaments without relation to any series and without playability, immobile, reasonless, for the philosophy of the play laboratory is quite unknown to the makers of play materials, while those who buy are guided almost entirely by convention and have no better standard by which to estimate what constitutes their money's worth. On the other hand enthusiasts raise the question, why supply any toys? Is it not better for children to make all their toys? And as Miss Pratt says, "getting ready for play is mistaken for play itself." Too much "getting ready" kills real play, and if our purpose is to foster and enrich the actual activity, we must understand the subtle value of initial play materials, of having at hand ready for the promptings of play impulse the necessary foundation stones on which a superstructure of improvisation can be reared. When by hook or crook the devotees of floor games have secured a population and live stock for their block communities, then, as Mr. Wells reminds us, comes commerce and in her wake transportation problems to tax the inventive genius of the laboratory. Simple transportation toys are the next need, and suitable ones can generally, though not always, be obtained in the shops. A few well-chosen pieces for initial material will soon be supplemented by "Peg-lock" or bench-made contrivances. For railroad tracks the block supply offers possibilities better adapted to the ages we are considering than any of the elaborate rail systems that are sold with the high-priced mechanical toys so fascinating to adult minds. Additional curved blocks corresponding to the unit block in width and thickness are a great boon to engineers, for what is a railroad without curves! Transportation toys can be perfectly satisfactory when not made strictly to scale. Indeed, the exigencies of the situation generally demand that realists be satisfied with rather wide departures from the general rule. Train service, however, should accommodate at least one passenger to a car. There are some important differences, however, between the content of a play scheme like this and one of the kind we have been considering (see cut page 30). These result from the size and character of the initial play material, for dolls like these invite an entirely different type of treatment. One cannot build villages, or provide extensive railroad facilities for them, nor does one regard them in the impersonal way that the "Do-with" family, or Mr. Wells' soldiers, are regarded, as incidentals in a general scheme of things. These beings hold the centre of their little stage. 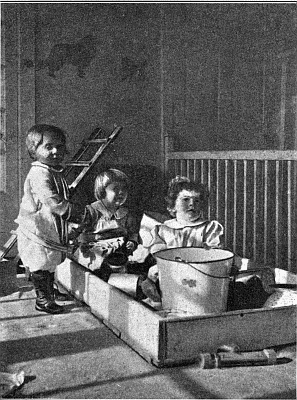 They call for affection and solicitude, and the kind of play into which they fit is more limited in scope, less stirring to the imagination, but more usual in the experience of children, because play material of this type is more plentifully provided than is any other and, centering attention as it does on the furnishings and utensils of the home, requires less contact with or information about, the world outside and its activities to provide the mental content for interesting play. 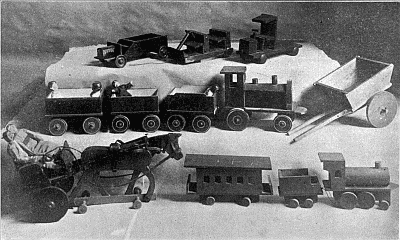 In the epochs of play development interest in these larger scale toys precedes that in more complicated schemes with smaller ones. Mr. Wells' stress on the desirability of a toy soldier population really reflects an adult view. 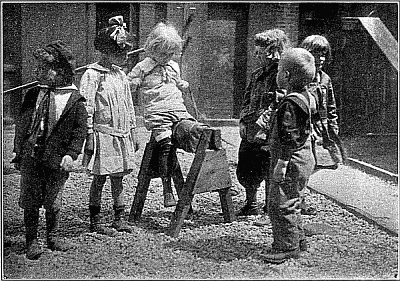 For play on the toy soldier and paper doll scale develops latest of all, and because of the opportunities it affords for schemes of correspondingly greater mental content makes special appeal to the adult imagination. Play material smaller than the "Do-with" models and better adapted to this latest period than are either soldiers or paper dolls remains one of the unexplored possibilities for the toy trade of the future. 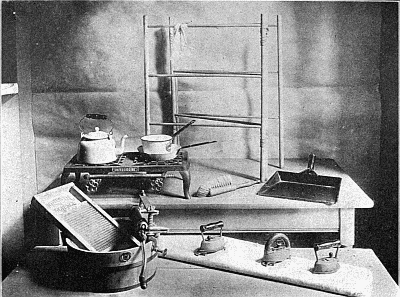 Materials for housekeeping play are of two general kinds, according to size--those intended for the convenience of dolls, and those of larger scale for children's use. The larger kind should be strong enough and well enough made to permit of actual processes. Plentiful as such materials are in the shops, it is difficult to assemble anything approaching a complete outfit on the same size scale. One may spend days in the attempt to get together one as satisfactory as that pictured here. The reason seems to be that for considerations of trade such toys are made and sold in sets of a few pieces each. If dealers would go a step further and plan their sets in series, made to scale and supplementing each other, they would better serve the requirements of play, and, it would seem, their own interests as well. From housekeeping play to storekeeping play is a logical step and one abounding in possibilities for leading interest beyond the horizon line of home environment. 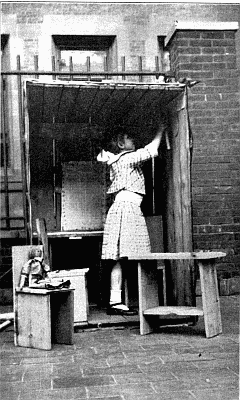 Better than any toy equipment and within reach of every household budget is a "store" like the one pictured here where real cartons, boxes, tins and jars are used. Schools can often obtain new unfilled cartons from manufacturers. The Fels-Naphtha and National Biscuit companies are especially cordial to requests of this kind, and cartons from the latter firm are good for beginners, as prices are plainly marked and involve only dime and nickel computation. The magazine "Educational Foundations" maintains a department which collects such equipment and furnishes it to public schools on their subscribers' list. Sample packages add to interest and a small supply of actual staples in bulk, or of sand, sawdust, chaff, etc., for weighing and measuring should be provided as well as paper, string, and paper bags of assorted sizes. Small scales, and inexpensive sets of standard measures, dry and liquid, can be obtained of Milton Bradley and other school supply houses. A toy telephone and toy money will add "content," and for older children a "price and sign marker" (Milton Bradley) is a valuable addition. 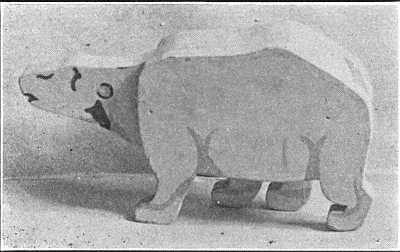 Modelling Materials--Modelling clay and plasticine, far from being the same, are supplementary materials, each adapted to uses for which the other is unsuited. Weaving Materials--Raphia, basketry reed, colored worsteds, cotton roving, jute and macramé cord can be used for many purposes. Material for Paper Work--Heavy oak tag, manila, and bogus papers for cutting and construction come in sheets of different sizes. Colored papers, both coated (colored on one side) and engine colored (colored on both sides) are better adapted to "laboratory purposes" when obtainable in large sheets instead of the regulation kindergarten squares. Colored tissue papers, scissors and library paste are always in demand. Color Materials--Crayons, water color paints, chalks (for blackboard use) are best adapted to the needs of play when supplied in a variety of colors and shades. For drawing and painting coarse paper should be furnished in quantity and in sheets of differing sizes. "If children are let alone with paper and crayons they will quickly learn to use these toys quite as effectively as they do blocks and dolls." As in the case of the carpenter's bench it is poor economy to supply any but good tools for the yard and garden. Even the best garden sets for children are so far inferior to those made for adults as to render them unsatisfactory and expensive by comparison. It is therefore better to get light weight pieces in the smaller standard sizes and cut down long wooden handles for greater convenience. 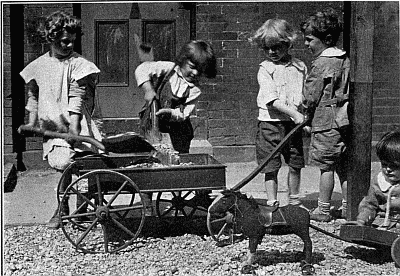 The one exception to be noted is the boy's shovel supplied by the Peter Henderson company. This is in every respect as strong and well made as the regulation sizes and a complete series to the same scale and of the same standard would meet a decided need in children's equipment where light weight is imperative and hard wear unavoidable. In addition to the garden set of shovel, rake, hoe, trowel and wheel-barrow, a small crow-bar is useful about the yard and, in winter, a light snow shovel is an advantage. 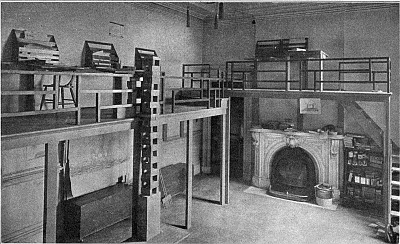 A small permanent exhibit of the play equipment described may be seen at the Bureau of Educational Experiments, 16 West 8th Street, New York, and is occasionally loaned. For convenience it has seemed well to divide the following list into two parts--the first devoted to the discussion of theory, the other offering concrete suggestions. Such a division is arbitrary, of course. No better exposition of theory can be found than is contained in some of these references dealing with actual laboratory usage and furnishings. On the other hand the two books by Dr. Kilpatrick, with their illuminating analysis of didactic materials, afford many concrete suggestions, at least on the negative side. "The Child: A Study in the Evolution of Man," Scribner, 1917. Chap. I, "The Meaning of the Helplessness of Infancy." Chap. II, "The Meaning of Youth and Play." Chap. IV, "The Periods of Childhood." "Democracy and Education," Macmillan, 1916. Chap. XV, "Play and Work in the Curriculum." "How We Think," D. C. Heath and Co.
Chap. XVII, "Play, Work, and Allied Forms of Activity." Chap. XVI, "Process and Product." "Interest and Effort in Education," Houghton Mifflin Co., 1913. Chap. IV, "The Psychology of Occupations." "The School and Society," University of Chicago Press, 1916. Chap. VII, "The Development of Attention." "Cyclopedia of Education," Edited by Paul Monroe, Macmillan Co.
"The Play of Man," Appleton, 1916. Chap. I, "The Pedagogy of the Kindergarten." "Youth: Its Regimen and Hygiene," Appleton, 1916. Chap. VI, "Play, Sports and Games." 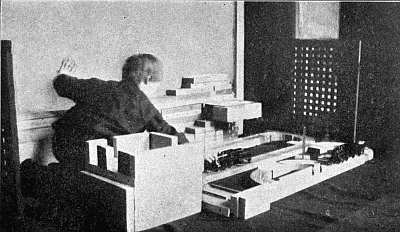 "The Montessori System Examined," Houghton Mifflin, 1914. 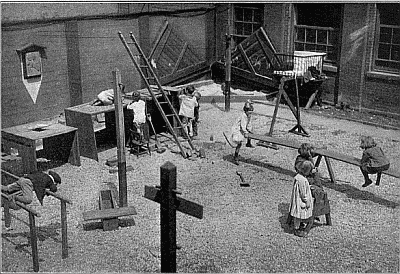 "Froebel's Kindergarten Principles Critically Examined,"
"Play in Education," Macmillan, 1915. 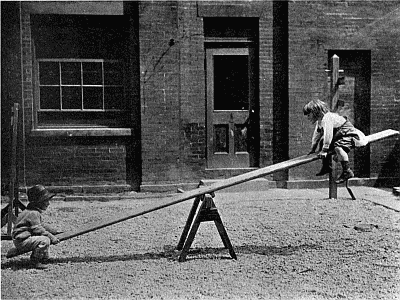 "Children's Play and Its Place in Education," Duffield, 1913. Committee of The Russell Sage Foundation. "The Play School," Bulletin No. III. Gregory School," Bulletin No. IV. 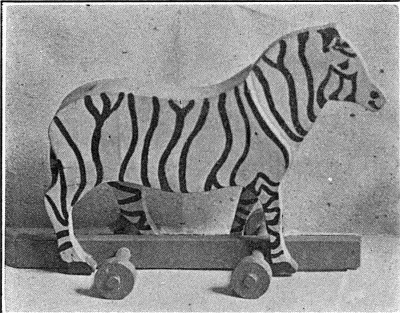 Bureau of Educational Experiments publications, 1917. 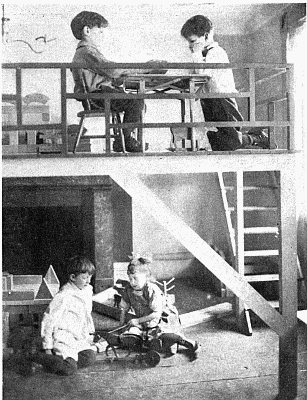 "Report of the Experimental Work in the School of Childhood,"
University of Pittsburgh Bulletin, 1916. 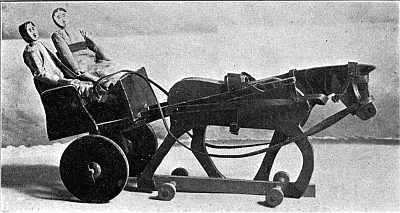 "The Play Way," Stokes Co., 1917. 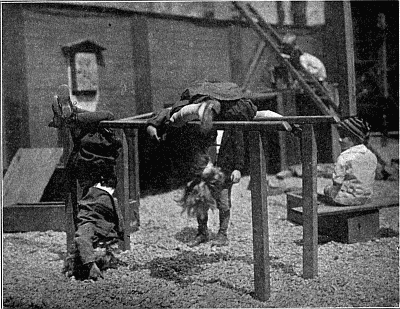 Playground and Recreation Association of America, 1913. 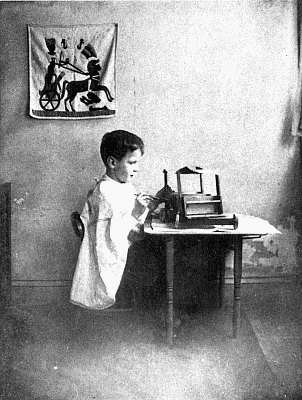 "Schools of To-morrow," Dutton, 1915. 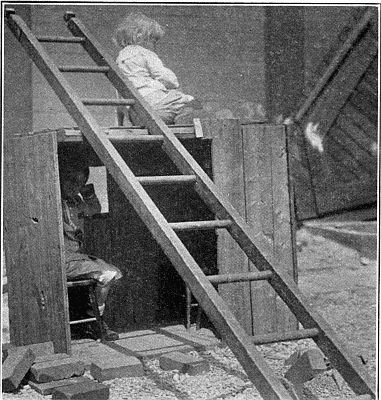 "Aspects of Child Life," Ginn, 1914. "The Story of a Sand Pile." "Education by Plays and Games," Ginn & Co., 1907. 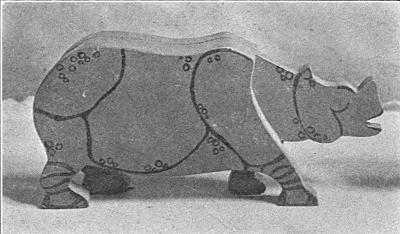 "The Mothercraft Manual," Little, Brown & Co., 1916. 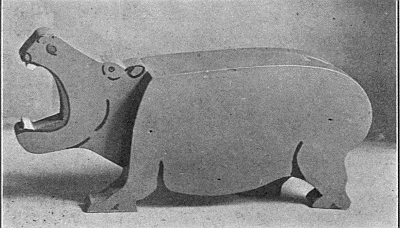 "Floor Games," Small, Maynard & Co., 1912. "The New Machiavelli," Duffield Co., 1910. Chap. II, "Bromstead and My Father."